Outside the Summit Logistics bldg. in South Fairbanks, the temperature was an icy -50°F. Inside, the temperatures ranged anywhere from 98°-102°, for the dogs, that is. This was Vet Check for the 2012 Yukon Quest, when mushers bring their dogs in to be checked by a brigade of volunteer veterinarians. The health of these animals are paramount for the mushers depend on them for their lives. At home, they are fed special diets with food supplements and vitamins. Their feet are inspected on a daily basis and any problems are dealt with immediately. Their training runs have been regulated and measured. By the time they arrive here, at Vet Check, they are (hopefully) at the peak of their powers. The mushers take great pride in the health of their teams. 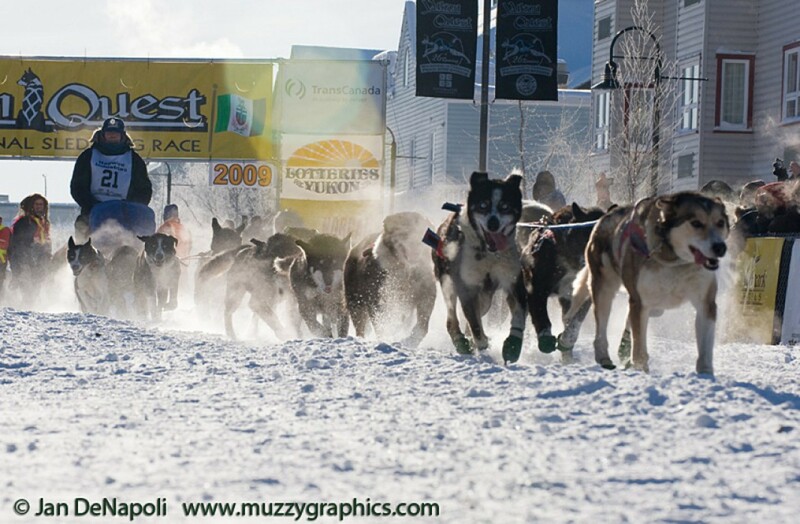 To win the Veterinarian’s Choice Award is a highly respected honor… “Presented to the musher who demonstrates outstanding canine care for their dogs throughout the race, in the best spirit of the Yukon Quest. ” The doctors here, mainly confirm the dogs’ good health, but occasionally they will run into a problem and they freely exercise their right to disqualify any pooch for poor health. This entry was posted in YQ2012. Bookmark the permalink.